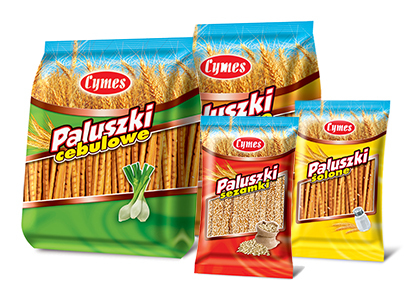 Cymes products owe their delicious taste to original recipes. We are inspired by the gifts of mother nature and therefore do not use any artificial colours or preservatives. We pay attention to every detail, from selecting the best ingredients, through monitoring production process to packing in airtight packaging. Our efforts result in products of unique taste and natural composition, available at an affordable price. We produce our sticks based on our own recipe, which has repeatedly been tested and modified until we have achieved a product that has gained recognition of connoisseurs. The secret behind the taste of sticks, however, is not only the recipe, but first and foremost the quality of the ingredients used. 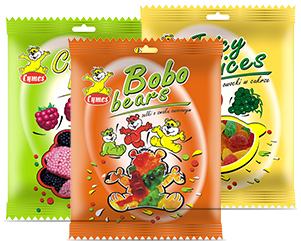 We produce jellies using our own original recipe, which is constantly being improved taking into account the feedback we receive from our customers. We strive for the ideal formula and it seems we have almost achieved it. Pebbles is peanuts with colored icing. 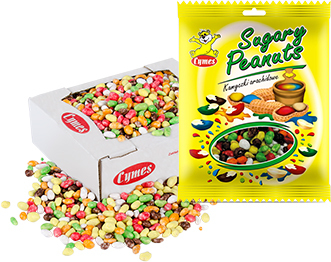 For production we use the highest quality peanuts, and each imported into our party is constantly monitored. Only fresh nuts give a guarantee of excellent taste. 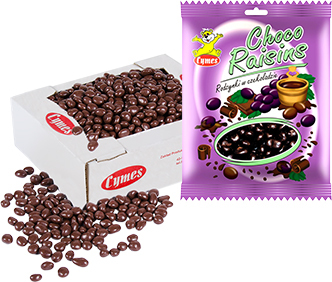 Choco raisins are among the favourite snacks of our customers. Raisins are coated in dessert chocolate, thus we combine the sweetness of the raisins with the natural taste of chocolate. That’s how we obtain the taste which our customers love. Jelly is a treat that appeals to both adults and children. Our jelly comes in different shapes and flavours. Pieces of jelly look like bananas, oranges and blackberries, popular with not only the youngest gourmets.